Seat slides from side to side, minimizing physical strain or user or caregiver. Textured plastic seat and back provide a non-slip surface nylon strap locks and holds seat in place. Durable, lightweight aluminum frame makes it easy to lift and move. This contemporary recliner celebrates style and comfort in a modern design. This finely upholstered chair features a quality crafted wood and metal frame, metal hardware, and plush foam and fiber cushioning. The low profile legs gives the chair a solid stability, and the durable metal hardware will keep the reclining mechanism working at its best for years. The tall, slightly angled backrest is padded with deluxe cushioning making it a treat to lean back and relax in style. This commercial grade banquet chair with crown back design fits well in formal and casual settings from wedding ceremonies to corporate meetings and awards banquets.The chair's cushioned back and 2.5 inch thick seat are padded with CA117 fire retardant foam. Its sturdy, 16 gauge steel, powder coated frame, with gracefully angled legs, has been tested to hold up to 500 pounds. Double support braces reinforce the frame to give it great strength and durability. Bumper guards prevent scratches on the frame when stacked (up to 15 high) and non-marring floor glides protect your floor by sliding smoothly when you need to move the chair.This durable Banquet Chair is an excellent option for churches, banquet halls, training rooms, hotels, convention centres and schools. 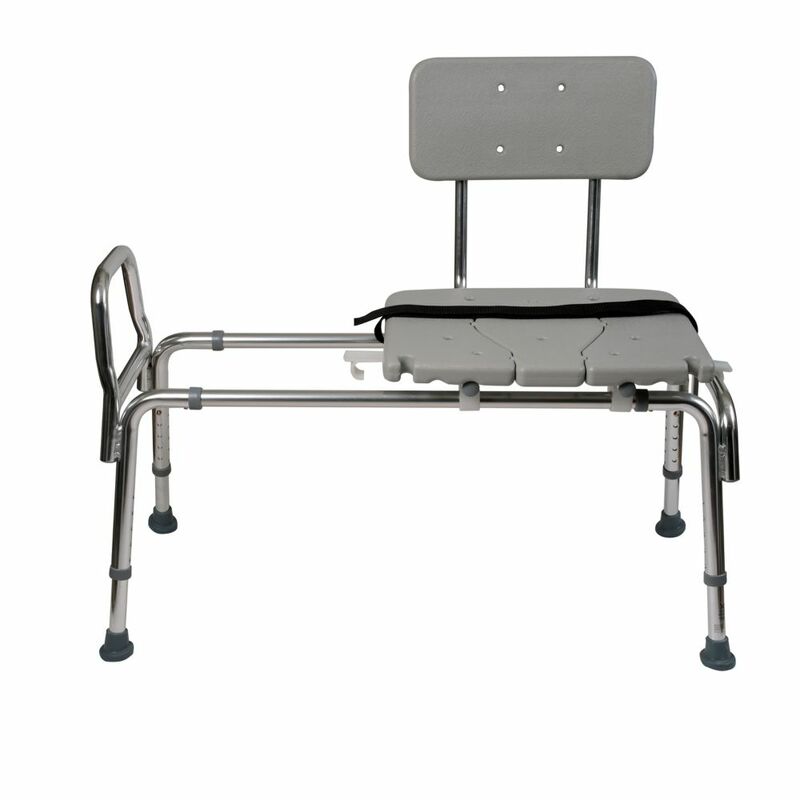 Heavy-Duty Sliding Transfer Bench Shower Chair This best-selling sliding transfer bench will provide welcome relief and increased independence for those who have trouble getting in and out of the shower, standing for prolonged periods or worries about falling. You can shower with confidence knowing you have a stable platform to sit on! Position one end of the bench outside the shower and the other end inside, making sure the legs are stable. Sit on the seat and easily slide across into the shower. Caregivers will find it especially helpful in transferring people using wheelchairs or walkers with this back-saving aid. This durable shower chair will make bathing much easier and safer for people with disabilities, older people or those recovering from surgery or injuries. The seat easily slides, minimizing physical strain on the user and caregiver. The backrest, which can be positioned for left or right hand use, provides additional support along with a seatbelt for safety. Heavy-Duty Sliding Transfer Bench Shower Chair is rated 4.7 out of 5 by 67. Rated 5 out of 5 by Ric from Easy to assemble. Very heavy duty but light weight... Easy to assemble. Very heavy duty but light weight to handle! Rated 5 out of 5 by Joey from Works great. ... Works great. Rated 5 out of 5 by Captain from Great for amputee-----wish I had known about this product years ago! Great for amputee-----wish I had known about this product years ago! Rated 5 out of 5 by Gla from Easy to assemble. Can be used facing any side.Great for... Easy to assemble. Can be used facing any side.Great for our small bathroom and shower space. Rated 5 out of 5 by Jan from This transfer bench worked very well. My husband is disabled... This transfer bench worked very well. My husband is disabled and I have to help him into the shower He is a tall heavy person and this bench has made it easy for me to move him without any strain.He can now take a shower sitting down instead of using a walker. It is sturdy and still light enough for me to put it in and out. Rated 1 out of 5 by Aleen from Does not work for my situation. Can I return... Does not work for my situation. Can I return it. Rated 5 out of 5 by Tracy from This bench is all I needed to bathe safely.... This bench is all I needed to bathe safely.